I am a new homeowner and am new to landscaping/gardening. I was wondering if anyone can help ID the tree below. I have no idea what it is. any help would be much appreciated! when those buds open up, it will be easier, but I think it is Rose of Sharon. More of a shrub than a tree, but it can be pruned in to tree shape. The one I have is a huge colony of those stems. 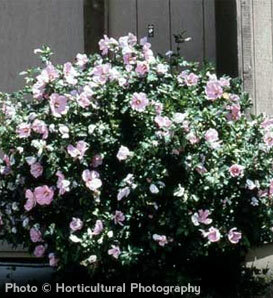 You posted your question and in half an hour got the answer, Rose of Sharon, Hibiscus syriacus. You are welcome! For a little bonus information, watch out for RoS, it spreads like crazy. Not only does the colony get bigger and bigger, but it pops up all over the place. I have one that popped up on the opposite side of my house from where the one I planted is and I pull shoots of RoS all the time.